"If you saw me walking down the street, you wouldn't point at me and recoil, but by Hollywood's standards, I'm a troll, ogre, woodland creature, or manly lesbian." 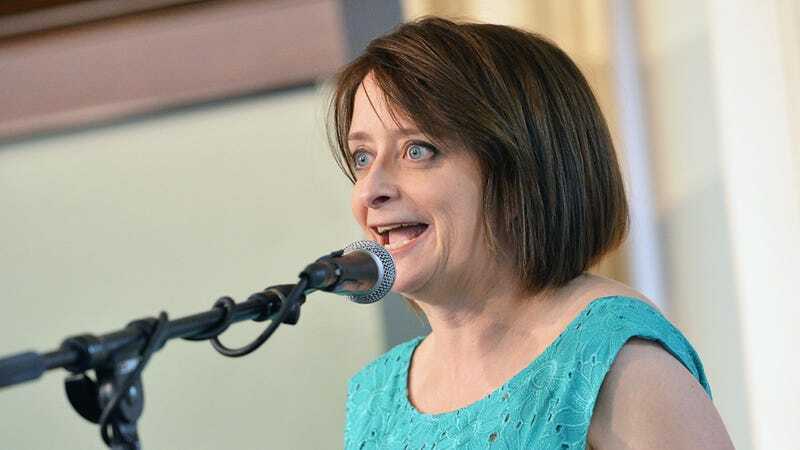 So writes Rachel Dratch in her new book, Girl Walks into a Bar: Comedy Calamities, Dating Disasters, and a Midlife Miracle. We're talking about a seriously funny woman: Sully and Denise/"Zazu"? Sheldon, the awkward, deadpan teen boy from Wake up, Wakefield? And the legendary Debbie Downer? Iconic characters from her years on Saturday Night Live, and yet: Her TV career has all but ground to a halt. Dudes like Tim Allen, Bernie Mac, Drew Carey, Jerry Seinfeld, Steve Harvey and Kevin James all went from being stand-up comedians to having their very own sitcoms, despite not being typical heartthrobby leading man types. So where is Rachel Dratch's Garry Shandling/Larry David-esque TV show? As you may know, in Tina Fey's original pilot script for 30 Rock, Dratch played the part of Jenna. When the part was recast with Jane Krakowski, Lorne Michaels said Dratch would "be able to portray many more characters and get more screen time." But the truth is, the network replaced Dratch with a pretty blonde. End of story. Now, Dratch says, when her agent calls — if at all — it's for the part of "a 55-year-old obese lesbian." Ridiculous. What Rachel Dratch needs is a self-aware new cable show, about the totally hilarious actress Hollywood calls for troll roles. A behind-the-scenes look at the biz, in the vein of Ricky Gervais's Extras, that exposes the grody stuff women have to deal with, in a funny way. I'd watch the crap out of that.